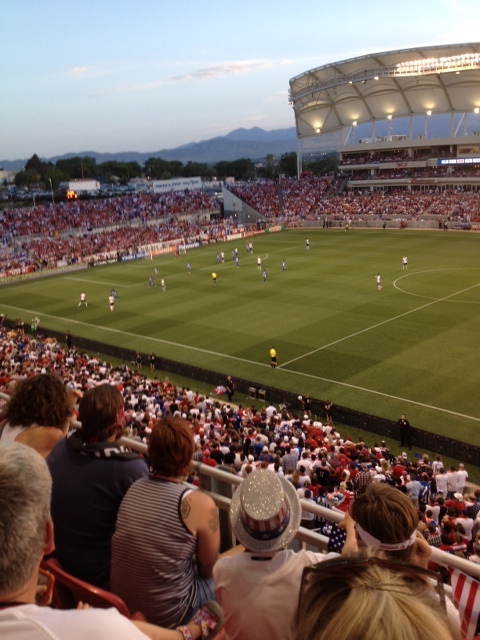 I attended the U.S.A.-Honduras World Cup qualifier in Sandy, Utah last night. Although I’ve been a dedicated soccer fan for over twenty years, this was my first opportunity to attend a professional match, and it was a fantastic experience! I will attend another one as soon as possible. Here are some thoughts and observations about the night. 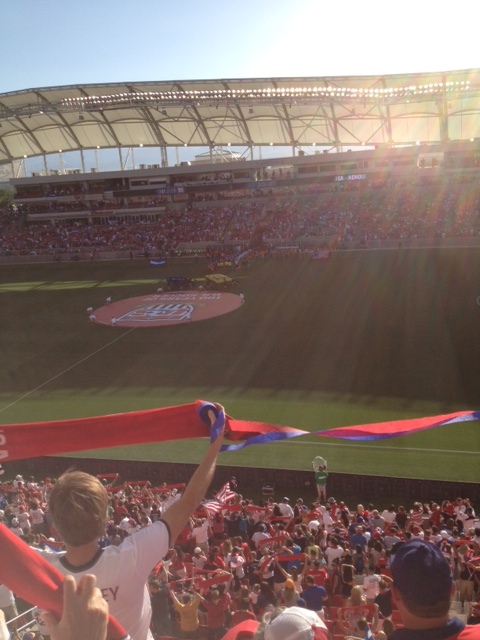 Even though Rio Tinto Stadium only holds 20,000 people (last night was a sellout, with 20,250 attending), it was extremely loud throughout the match. I loved this atmosphere, which doesn’t always come across when watching on television. There were four people two rows behind me yelling insults at Honduras in Spanish the entire match, which was fantastic. There were several rousing “U! S! A!” chants throughout the evening as well. 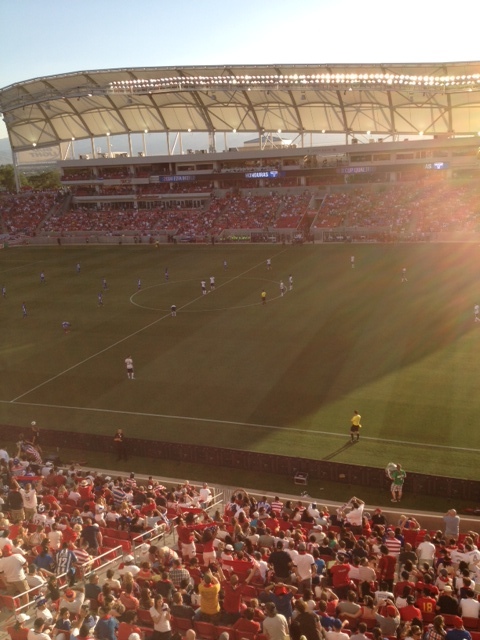 While Rio Tinto offers beautiful views of the surrounding mountains, the second deck where I was sitting (the only one, which is a bit unusual) faces west, thus the sun was in my eyes the entire match. It would make much more sense to have this section facing east. When Jozy Altidore’s goal was called offside midway during the second half, the scoreboard did not show the replay, protecting the referee and linesman, but when Altidore scored the match-winning goal later on the scoreboard did show the replay. The stadium exploded when the ball went in the net, constant noise for about a minute. I was jumping up and down and screaming–the adrenaline just took over. It was refreshing to be able to see the entire field and what all twenty-two players were doing at once rather than having my view limited by what the television producers chose to show. It becomes much clearer just how much of a team game soccer is. Similarly, the field feels much smaller live than it does on television. Overall, it was a good result for the U.S., and a fair one based on the flow of the game. They lead the Hexagonal with thirteen points after six matches. Their next two matches are difficult ones, away to Costa Rica and home to Mexico, and while they have a good chance of taking all six points from those fixtures if they keep playing at their current level, realistically they could lose those two matches and still qualify for the World Cup because their final two matches are Jamaica at home and Panama away. The two teams coming out onto the pitch at the beginning of the match. Second half action with the Oquirrh mountains in the background. 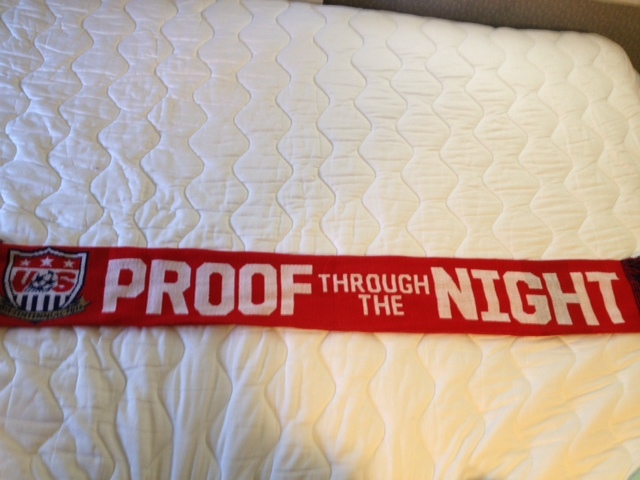 One side of the commemorative scarf that was handed out at the match. 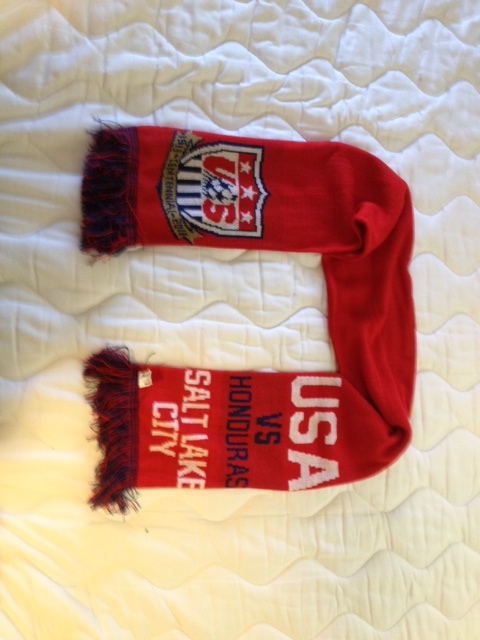 The other side of the commemorative scarf. Reblogged this on Soccer Games Here.